This is a book I've always meant to read, so when I saw it at the book exchange shelf at my husband's workplace here in Shanghai, I picked it up. Took this out of genevalove's Skinny Books Bookbox. Looks good. 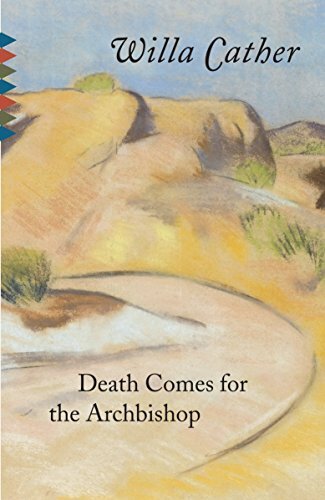 From the back cover:" There is something epic -- and almost mythic -- about this sparsely beautiful novel by Willa Cather, although the story it tells is that of a single human life, lived simply in the silence of the desert. In 1851 Father Jean Marie Latour comes as the Apostolic Vicar to New Mexico. What he finds is a vast territory of red hills and tortuous arroyos, American by law but Mexican and Indian in custom and belief. In the almost forty years that follow, Latour spreads his faith in the only way he knows -- gently, although he must contend with an unforgiving landscape, derelict and sometimes openly rebellious priests, and his own loneliness. Out of these events Cather gies us an indelible vision of life unfolding in a place where time itself seems suspended." I just finished this book and it was really beautifully written. So many times, I picked it up and this time I was determined to read it. It was very descriptive and somewhat slow at times, but very beautiful and very spiritual. It is a must read for anyone interested in New Mexico. I haven't read it yet.I'm taking this to Britain with me and will release it there. Since I don't know either where or when, I'm not making release notes.